I am lost here. Is this after the crimson changeling queen's death and older Twilight has resurrected? What is that behind Rarity and Fluttershy in the statue? Is it twilight? Spike? That is Twilight's head broken off. The wings belong to her statue as well if you follow the statues body. What happened to the Twilight statue? can I use this for a story? He means that he's already doing a comic of it! This . . . just makes me feel sad . . . being the Princess of Friendship must be terrible. To make friends, the best of friends, and then . . . have them leave you. And even if you make more friends eventually, you live with the knowledge that they'll leave you, too. And you either get numb to it, which is horrible, never make friends again, which would be terrible, or always feel that pain anew, and feel it build up with each new friendship and passing on of a dear companion . . . .
. . . . which is the most human response of all. It requires a lot of strength and courage, to face those years alone. And I suppose I know from experience. I have moved a lot in my lifetime, and my friends have moved in turn. Only ever one in seven times do I see a close friend ever again after departing. I am used to it, and it hurts, but I continue to make new friends. I am unsure how I would be able to bear it, should such things come from the passing of time, the aging of my companions, and the youth of my own eternity. I described the potential outcomes fairly well, already, I beleive. 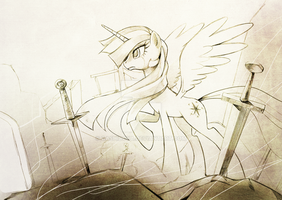 Wow, this makes me cry, because twilight is going to live for who knows how long because of her now being an alicorn. This is beautiful! I love it. Just, it's perfect. Well, in official canon, she still has a normal lifespan. You can do what you want in fanon/head canon though. Oh... so this is why the comic started. and Spike is still playing castle janitor . . . Relax, there is nothing to worry, this will not happen, as a friend he read by Twitter of some of the people who work in the series (including Meghan McCarthy) have said very clearly that no immortality it will go into Twilight and she will never leave her friends. Johnny Cash - Hurt fits this. Twilnight Sparkle starts to sing a song: "I've walked too long in this lonely lane, I've had enough of this same old game, I'm a man of the world, they say that I'm strong, but my heart is heavy and my hope is gone, Out in the city, in the cold world outside, I don't want a pity, just a safe place to hide…"
"Leave me be, please." She said to you. "I'm sorry, princess. It's my duty to safeguard your life." You replied. "I decide your duty. Please leave me alone for now." Here she is. Here she is again. The moonlight shines above her, illuminating the granite statues of five mares. He read the the books. They were very special to her. To Equestria, all bearers of the Elements of Harmony. The one with the fiery eyes and roughened hair was Rainbow Dash. The bubbly one is Pinkie Pie. The one with the hat is Applejack. The elegant one is Rarity the shy one is Fluttershy. There was another pony, standing on top with wings spread. Princess Twilight defaced it a day after this masterpiece was completed. "A sorrow shared is a sorrow halved." Twilight snorted. She smiled, but her eyes showed a measure of loneliness. "Quoting my own words back to me. Flattery or rebuke... Which one is for me?" "Neither. I'm simply concerned. You always come here when you're sad." "... I tell all my troubles to my friends." "They aren't here anymore." You said it as blunt as a hammer to the head. "I'm not best in giving advices, but doing this isn't healthy for a pony." "I know... but still," Her words hang in the air. She looks up to the beautiful night sky, "Sometimes I wonder how Celestia and Luna copes with immortality..."
I feel like you should have added twilight to the statues. I mean she was part of that group and having a statue made for just 5 of them doesnt seem right. headless part was twilight's statue. Why exactly is she headless? And what the heck happened to it? maybe she broke it herself.